Well here's a nice surprise: Nintendo has just revealed two newly refreshed 3DS designs, which will squeeze in an improved screen, NFC support, better battery life, and - wait for it - a second directional button. 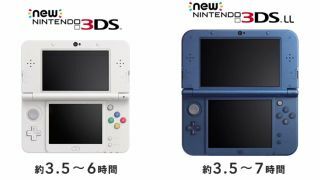 In a Nintendo 3DS Direct presentation, the updated handhelds, dubbed the "New 3DS" and the "New 3DS LL" (which will be XL over here), were announced for a Japanese launch, though we suspect it won't be long until they voyage to our shores. Nintendo's upped the screen size of the standard unit from 3.53 inches to 3.88 inches but is keeping the XL the same at 4.88 inches. The new hardware also adds in additional shoulder buttons and a better CPU, which means some future games won't be compatible with the current model. And for anyone out there who's actually switched on the 3D effect in the last year, the new screen will offer improved viewing angles for better stereoscopic pop. Additionally, Nintendo's ditching the SD cards in favour of MicroSD, and has moved the cartridge slot to the bottom - probably just for the sake of messing with us. But yes, it's the second circular pad (named the C-Stick, after the GameCube) that we're most pleased to see. Remember when Nintendo tried to solve the problem with this? Both handhelds will go on sale in Japan on October 11. We're chasing up with our Nintendo contacts now to see if there's any word yet on a global release.